If you want to know how to make barbeque side dishes, the sky is the limit for cookouts and picnics. These foods are not just limited to the ones which can be cooked on the grill, but some dishes are just considered necessary to an all American cookout. Over the years, I have often worked for several days in the kitchen prior to an approaching holiday picnic preparing the typical barbeque foods. What would a picnic be without baked beans, potato salad, macaroni salad, slaw and banana pudding? On occasion some picnics have to also have fried chicken. Whether you are planning a light lunch in the park, a beachside cookout, a camp out, a tailgate party or a huge family barbeque proper food preparation and packages are of the utmost importance. When learning how to make barbeque side dishes you must know that food left standing too long at warm temperatures, bacteria such as salmonella can grow to dangerous levels. This will lead to food poisoning. This could cause serious illness or even death so take caution when planning for these get together. The best foods to pack for these events are ones that keep well. If you are learning how to make barbeque side dishes, know that the biggest threat comes from creamy products like milk and mayonnaise. A good replacement of salad dressing are those made with vinegar and oil instead of mayonnaise. With careful planning you can include these dishes; I have always prepared and taken anything I wanted (potato salad, macaroni salad, slaw, banana pudding) and never had anything go bad. All cold items should be prepared ahead and chilled thoroughly before packing; then pack them in ice. Saying this, I mean have the foods in airtight containers with good lids, then pack ice all around the containers in an insulated cooler. At the picnic remove these from the ice at the last minute before eating and return to the ice as soon as possible. Barbeque side dishes which are to be served hot can also be packed with caution. I have always made hot dishes for picnics like bake beans and many casserole recipes. I usually prepare these in iron skillets or pans and bake them in the oven timing them to be done about the time I want to leave for the event. The iron holds the heat for a long period of time. As soon as removing the recipe from the oven I cover with the lid. I have already prepared a box which the pot will fit into lined with a heavy folded clean blanket. I lay some clean towels on top of the blanket and set the pot in the box folding the towels and blanket to cover the pot completely. Every time I have taken a pot to set on the table it has still been so hot I had to use towels on the handles to lift it out. After eating if any of these barbeque side dishes is left have small plastic containers with you to hold leftovers so it can be placed in the ice to take back home. There are so many baked bean casserole recipes which I have made over my years. 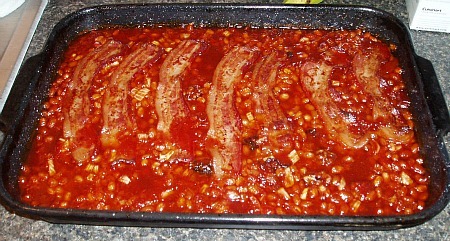 This is one of the standard barbeque side dishes for picnic; it is not a picnic without baked beans. I prefer the recipes which contain a variety of beans like this one. Brown bacon and onion in a large Dutch oven; drain fat. Add remaining ingredients and mix well to blend. Bake in preheated oven at 350F degrees for about 1 to 1 ½ hours or until beans are hot and bubbling. This is one of the delicious barbeque side dishes that will need to be kept chilled if taking to the park for a picnic because of the creamy yogurt. Drain pineapple, reserving 2 tablespoons syrup; in small bowl combine syrup, yogurt and lemon juice. In large bowl combine drained pineapple, cabbage, orange sections, celery, walnuts and raisins. Fold yogurt dressing into cabbage mixture; gently fold in banana, cover and refrigerate until serving. Although this is one of the safer barbeque side dishes which contains vinegar and oil for a cook out, like any food caution should be taken to keep it chilled and safe to eat. Place bread cubes on ungreased baking sheet; toast in preheated 350F degrees oven for 10 minutes; cool. Combine in a large bowl the toasted bread cubes, tomatoes, bell pepper, celery, meat, and basil; toss to blend. In a small bowl combine olive oil, vinegar, garlic, fennel, salt and pepper; mix well. To serve pour dressing over salad and toss thoroughly; let salad set 10 minutes to absorb before serving. Beginning and ending with pineapple, thread fruit alternately on skewers. Brush kabobs with butter honey mixture. Grill kabobs over medium hot charcoals 3 to 5 minutes or until heated through. Turn once or twice and brush with honey butter; serve with pound cake. Pull back the husk on the ears of corn and remove the silk; close the husk tightly. Butter the ears of corn in the hot ashes of the fire; leave there for 30 minutes or until kernels are tender. Remove the husks and butter the kernels; serve immediately. Remove husks and silk from ears of corn. Mix softened butter with salt; spread each ear of corn with mixture. Sprinkle each ear of corn with grated Cheddar cheese; double wrap each ear in foil. Grill 6 to 8 inches from hot coals about 15 to 20 minutes turning frequently until hot and cheese is melted. Wash the plantains well and slit the skin from end to end. Place the plantains on a grill rack over charcoal embers. Grill for 15 to 20 minutes turning the plantains often to make sure it cooks on all sides. A skewer inserted in the slit should show no resistance when the plantain is done. Remove the plantain quickly and spread with butter as serving.